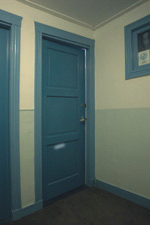 A painting interior color scheme is about matching colors. You do that on esthetic grounds. But: technical elements explain, why colors look nice together. On this page you'll find info on the deciding elements: tonal range, shading, contrast and intervalcolors. A tonal range is: a composition of light, medium and dark colors. You can see the tonal value of colors, if you look at them through your eyelashes until you see things in black and white. In a small, dark room, let light colors take the big surface, and dark ones are added as details (pillows, pictureframes, etc) In bigger, lighter rooms, medium colors (or in specific cases, even dark colors) take up the big surface, and light colors make higlighted details. Not all the colors in your room will be in the paint colors, so they dont all have to be in your color scheme. 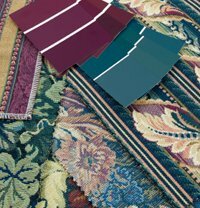 Eventually, get paint samples in the colors of your flooring, furniture etc., and match them with the paint colors. If your tonal range is limited (no big extremes in light and dark colors) the general impression will be more dreamy. Which can be nice, or a bit dull, depending on the situation. If you have strong light-and-dark contrasts, the impression will be more bold. To put in some soul, add medium tones as well. 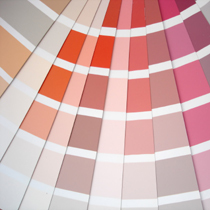 When you choose or make an interior painting color scheme: Taste, smell, and use your imagination. First look at your furniture, and where the light comes from. Take your time, and keep your color system as simple as possitble (3 or 4 shades is enough). Find out more on the designing process here. The usual color schemes you find on house painting sites (like Benjamin Moore) are good examples, but theyre rather general. Eventually adjust them to your available light. A great help in creating a color scheme is the graphic program Color Style Studio. 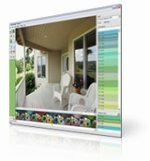 You can upload your own picture, mark your walls, trim and furniture as fields, and color them with the interior paint colors of your choice. In this way, you also get an idea of the visual amounts, the light etc. Check it out here. Shading means, to match colors that are neighbours in the color wheel. Note that all warm pinks, beiges and browns are shades of oranges or reds. Cold browns (like oak wood) too, but they have green added to them. Shading is good for small rooms- it creates a visual whole. Shading gives a pleasing variety of one color or color-group (lets say: browns/reds, or greens, or grey and blues, or yellow and orange). Make sure you have a tonal range (light, medium and darker colors) A good interior painting color color scheme has, apart from darker and ligher shades, also a little color variety (for example, brick orange with a lighter, more yellow ochre shade). for the adventurous: doing your own mixing and shading is an option if you want to keep things cheap. In mixing, note that a little bit of dark paint weighs up to a lot of white paint. Adding pure white is not really an option for shading, exept for the blue-tones (from blueish violet up to turquoise) in a warm room (south and west faced windows, or homes in tropical areas). Otherwise, shading by pure white might look abstract and not very lively. For warm colors and north-faced rooms, use an off-white for shading, and carefully pick the shade of the off-white (beige is OK for reds, browns and greens) For greens, it can look very nice to shade the other way around: having a very light colder, more bluish green, and a warm dark green (like plant leaves). Contrasting colors turn grey when you mix them, but placed side by side, they bring each other out. That works really great when you use moderated tones. For example: blueish grey and warm brown make each other look very interesting. They bring out each others orangeness and blueness. The mailbox on this picture is painted a warm-neutral grey. But it takes on a bluish shade, because it contrasts to the orangeness in the brick. When you use outspoken colors, the effect of contrast can be overwhelming, and you have to break the effect. You can do that, putting bits of paint in the opposite colored jar. Strong contrast on a painting is nice, but in your living spaces you can have it only in small visual amounts. When you think of contrasts, also think of light and darkness, of material qualities (like shiny and matte, velvet and glass, old wood and stainless steel) These are also effects you can use, to bring your interior to life. This is the kind of contrast your body generates. You can see it, by staring at one color (a red light) without blinking, and then shifting your gaze to a white sheet of paper. The color difference can be explained by the color mixing as light, or the interval color: the body mixes in some yellow. This is not a widely known color effect. Its about two colors, calling up a third ethereal color by laws of light and shadow. The following pictures have been painted (in a graphic program) each with only TWO colors. The colors in the middle appear all by themselves. This phenomenon can be explained more or less, by seeing it as colors mixing as light. 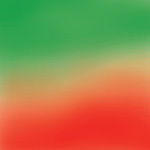 When the effect is slightly present in a watercolor painting, it appears stronger in a photograph of the picture, or by or putting the picture on an lcd-screen.